A quirky and fun movie about an unusual detective and his assistant solving a case. Brief review: Zero Effect is a fun movie. it’s a strange and quirky comedy about a bizarro detective who does things his own way. the detective is played by bill pullman and the real humor of the movie comes from the relationship between he and his assistant, played by ben stiller. just like the sherlock holmes – watson dynamic, the crazy detective here constantly frustrates his down-to-earth assistant. 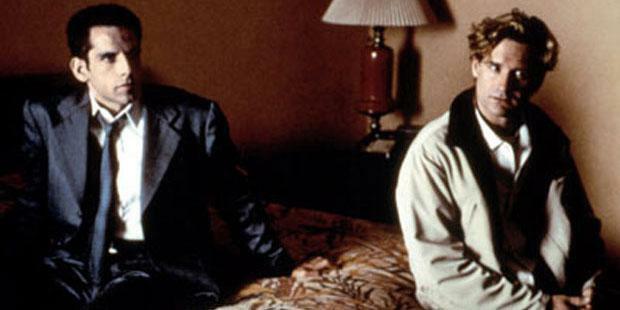 both actors handle the material perfectly, and the anger and animosity really comes through. the mystery itself is a little weak, and when the story focusses more on that then on the relationship between these two, it starts to lose it’s appeal. the film is better in the first half than the second, but it is still an enjoyable film. Zero Effect is an unusual and quirky black comedy. this one is about a bizarro genius detective. sounds a little bit like sherlock holmes, right? especially when you consider that the detective’s assistant is the rational, down-to-earth guy who is constantly getting frustrated by how strange his employer is. 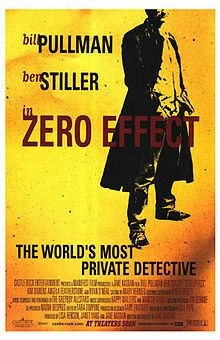 despite having those basic similarities to the classic arthur conan doyle series, zero effect actually manages to feel very different. maybe that’s because it is going for comedy more than crime, and because the humor might be dark, but the atmosphere is more light and breezy. at the start of the movie, we meet steve arlo (ben stiller) as he goes off on a monologue describing the cunning brilliance of his employer. he describes detective daryl zero as a man who can do some of the craziest things just by quick intuition (he can tell a ton of little things about you within minutes of meeting you.) steve goes on and on painting a picture of this secretive yet amazing man and then we suddenly cut to a bar where steve is again talking about daryl zero. only this time he’s talking about what a psycho the man is and how terrible a person he is. the rapid change in both setting and attitude is very funny, and launches us off in the right direction to start the movie. it turns out there are two sides to steve. there’s the professional side, in which he talks up his employer and how remarkable the man is, and presents this angle to any potential clients, and then there’s the personal side, in which he feels tormented by the man. daryl zero appears to have no respect for steve, his time, or his feelings. the man does whatever he wants, walks all over his assistant, and thinks it is acceptable because steve is being well compensated for his work. we follow these monologues by seeing the other side of the conversation and meeting the people who steve is speaking with. the man at the bar is just a friend, but the first man, who steve is meeting with in an office, is a new client. this is gregory stark, played by ryan o’neil, and he is willing to pay the ridiculous amount that steve is asking for because he believes that there might actually be some merit to this strange detective. he has tried other, more traditional, private eyes first and had no success. it’s not long after this that we get to meet daryl zero for the first time. we follow steve into the detective’s home, with long tracking shots that take us through one security system after another. the first system, with metal door that slide open on diagonals, is like something out of get smart. the others are a little more standard (lots of locks and then an alarm.) steve finally makes it inside only to hear the horrendous singing and guitar playing of his boss, (bill pullman), who is wailing an awful song at the top of his lungs. steve was just talking, in his monologue, about how terrible zero is on the guitar and with singing. steve explains the case to zero, and after some careful thought, zero agrees to take it. he wants to get to work right away, and that means steve will not get any time to see his fiancé, who lives in this town. he won’t even have the chance to take her out to dinner that night. instead, he and zero immediataly fly to their first location. the case begins with zero wearing a disguise, going to a gym, and approaching the man who hired him, while pretending to be a total stranger. zero boards a treadmill beside the man, attempts to make small-talk, and then notes a number of interesting things about the situation. later on he recounts the little things he notices to steve, such as that stark is lying about the speed he’s running at. while at the gym, zero also meets a local paramedic, gloria, played by kim dickens. she’s trying to get her name penciled in for the same massage appointment that he’s going for, and the two of them exchange some playful words. zero tells her that he knows she’s a paramedic because she just has that sort of look to her. gloria wants to know what this means and is very curious about him. circumstances in the case end up brining gloria back into steve’s life and she starts appearing more and more. eventually they even start dating. the movie works when it is humorous. mainly this is when ben stiller is featured. there are two relationships in this film. the relationship between zero and steve and the relationship between zero and gloria. the gloria relationship is the usual mushy, cliched, falling in love when you least expect it, kind of thing. it’s the steve and zero relationship that really carries this movie along. zero constantly puts steve through the ringer, and this includes making him fly all over the country just so the two of them can speak face to face. when steve asks why they couldn’t have just had the conversation over the phone, zero tells him there was no rush or time-frame, so why risk the long distance telephone lines. then in another moment, the two of them sit at the same panel of payphones at an airport phone bank, talking to each other through the phones. unfortunately, the movie starts to lose its momentum in it’s second half. it never completely loses its way or falls off the tracks, but the humor is certainly traded in for story, and the story that this movie has going for it is really nothing out of the ordinary. we’ve seen these kinds of mysteries before, dozens of times, and even a small surprise here or there isn’t enought to really captivate us. there’s a reason why stiller and pullman are the two leads of the movie and the two recognizable names on the marquis. the movie should have featured more of them and their relationship and less of the zero-gloria stuff. zero effect is a good, fun movie that just gets a little too serious and plot oriented towards it’s ending. there’s definitely humor interwoven throughout the entire film, but maybe it’s that we get a little tired of the characters the longer this goes on. zero has a very funny line around the halfway point or so, about finding what you’re looking for when you’re not looking for anything at all, because there are lots of things in this world, and if you’re not looking for anything in particular then the chances of you finding anything at all are pretty high. after that great line, the film is pretty much all downhill. it is never bad or anything, just not as strong as it was in the first half. still, overall, zero effect is a cute and enjoyable movie.